About 2 years ago, I received a telephone call from the original owner of Footloose to ask my advice. Due to changing family circumstances, he had reluctantly decided to sell his boat and wanted to know the best place to advertise and what a realistic resale value was. I gave the appropriate advice, adding a seemingly throw away remark that I would like to buy her myself, but money was a bit tight. I promised to ask a few contacts if they could be interested and would get back to him with some additional information as soon as possible. Some days later, there was another telephone call from the owner, he told me they had a family conference, and decided to offer the boat to me at a very favourable price if I was interested, because “They would rather it return to the man that built her than a stranger.”. 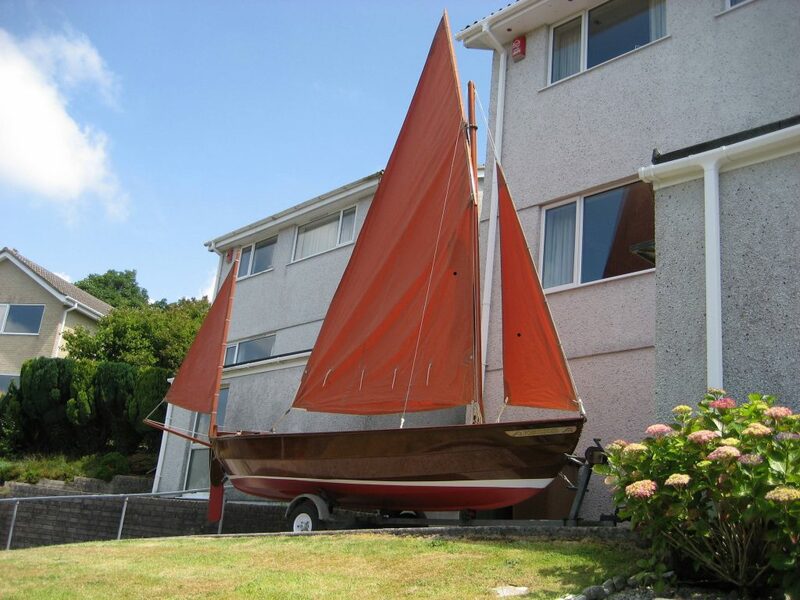 It was an offer too good to refuse, so arrangements were put in place for me to complete the purchase and bring Footloose back to her original home in Devon, where I built her in 1978. I have a kind neighbour who allows me to keep Footloose in her garage and that is where she now lives. Many readers may not know John Watkinson’s Scaith. She was originally designed to be built in wood as an alternative to the Skiff or Lugger, a much lighter weight and smaller boat than the Lugger, but a ‘Big Brother’ to the Skiff. The concept being to have a boat with better sailing ability and the capacity to have an outboard motor mounted in a well. The Skiff doesn’t have that capability. I suppose it could be compared in some ways to the Lugger and Longboat, the Longboat having more capability than the Lugger. 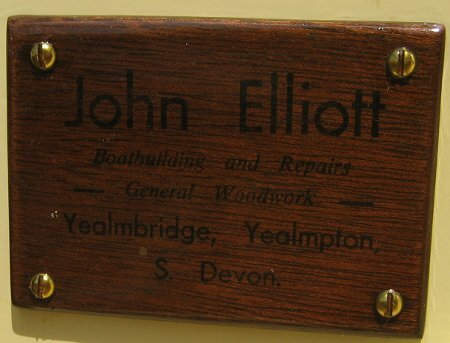 Elliott Boatbuilder’ badge, all of the Scaiths were actually built by me, not by intention, it just worked out that way, boats were built by whoever was available at the time, it could have been my brother or it could have been me, strange that it worked out to be me that built every Scaith! The Scaith became a good alternative to offer people who wanted something just a bit bigger than a Skiff, but still with the appeal of a canoe stern, which cuts a very clean passage through the water when the outboard motor is fully raised. 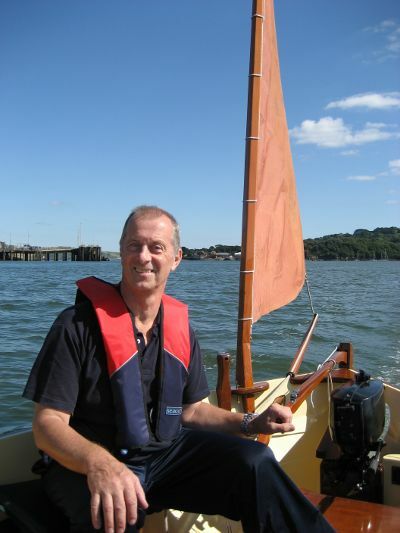 We had one owner who upgraded to a Scaith from a Skiff we had built for them the previous year. 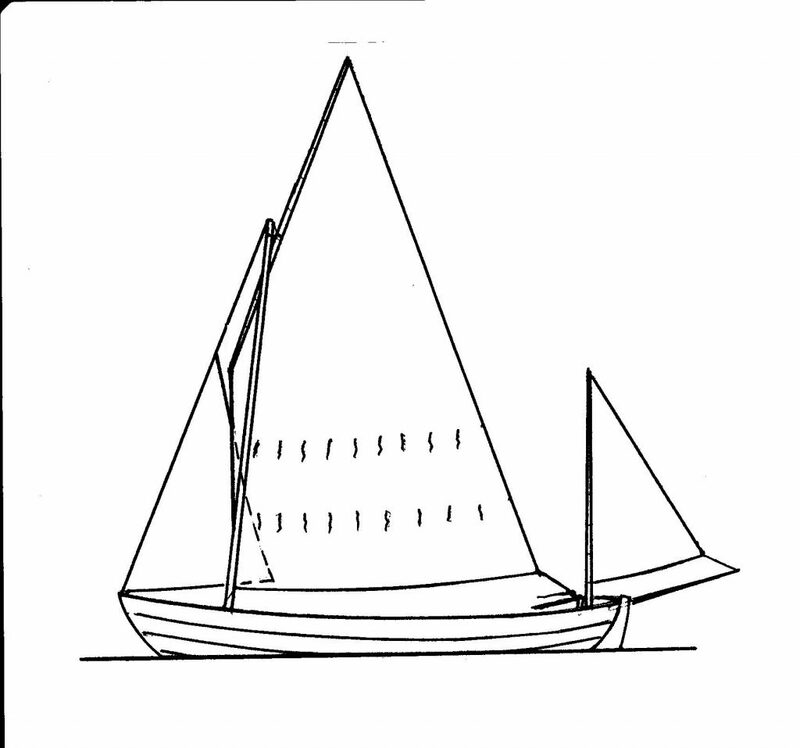 The Scaiths were offered with a mainsail only, jib and mainsail, or jib, mainsail and mizzen, The last option providing the familiar three sail combination easily recognised on many Drascombes. 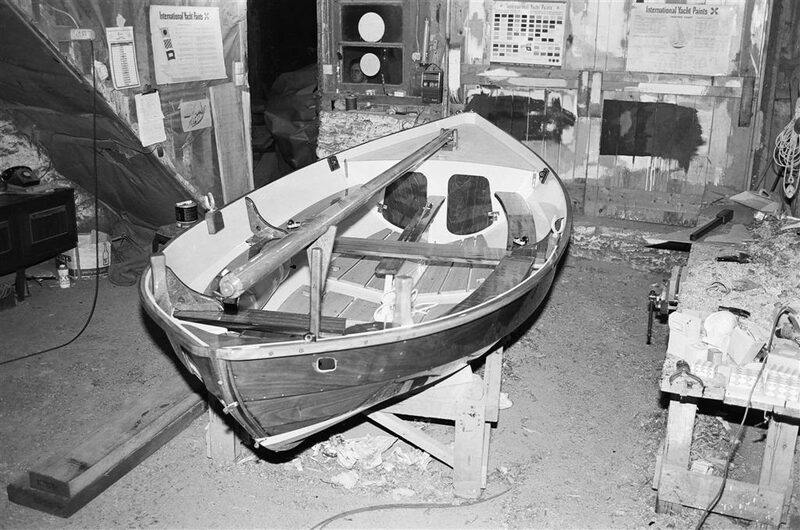 After the extensive use that John Watkinson had put his Scaith to, he decided to redesign the boat and incorporate a few changes that he thought would improve the performance, the redesign was named the Peterboat 4.5 metre, which from a distance is almost indistinguishable from the Scaith. 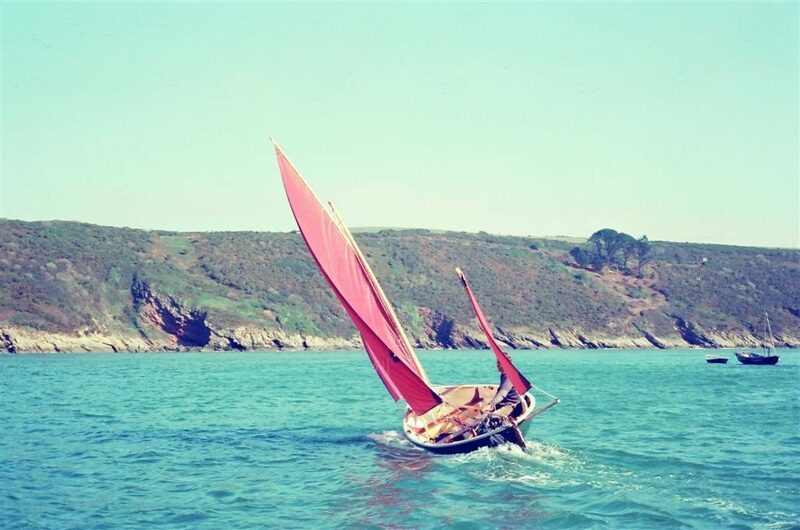 This idea was then extended to inlude the Peterboat 5 metre, essentially a stretched version of the Peterboat 4.5 metre(a similar concept to the Lugger and Longboat)then eventually the Peterboat 6 metre. All of which have similar hull characteristics. The Scaith production was discontinued in favour of the Peterboats. Now back to Footloose. The first task was to survey the boat to decide what was needed in the way of repair and restoration. The boat in general was very sound, but a few minor repairs were needed, nothing very drastic. The process started with a series of photographs to record all the fitting and fixtures. There were all of the originals, plus a few later additions. The next move was to strip the boat of everything that could be unscrewed or unbolted, back to the bare bones, including removing the centreplate, which remarkably still had the original galvanized bolt, although worn slightly. A new stainless steel bolt is now in place. The winter weather was not good enough to do much outside work, so I decided to leave it until the spring of 2008 before starting the major work. At least with the boat stripped of everything possible, I had made a start. What I didn’t plan for was managing to quite badly break my foot before I continued with the work, this caused real difficulties for me, and so I resigned myself to not carrying out the restoration for a while. Breaking my foot gave a whole new meaning to the name Footloose it now has a triple meaning. 1. A loose footed sail. 2. The expression Footloose and fancy free; meaning go and do as you please. 3. A real loose foot !! But that is all forgotten now and I’ve enjoyed the restoration work that I eventually started in February 2009. A telephone call to a marine paint specialist supplier Dove-Medows Marine Coatings provided me with the information regarding the paints and varnishes I would need. This was of particular importance to me because I wanted to restore Footloose to the original specification. Rupert who owns the business with his son, is an old friend who provided the paints and varnish for the original coatings when she was built, we used to obtain all of our paints and varnishes from him. I found out that I could still get the original specifications, although the names of the products had changed and the type of paint was a little different in chemical composition. This was good news, as I now knew my aim to restore to the original appearance was possible. The original finishes were Moisture Cured Varnish (now known as Universal Clear Primer) which was used as a primer to the entire boat, and as a finish to the masts and spars. The inside was painted with International Undercoat for Cream and International Yacht Enamel Cream 027 for the final gloss, the for’d locker finished with International Red Danboline, the topsides and all bright work finishes with International Blue Peter Varnish, the underwater finish was International Hard Racing Copper Red and the bootop line International Bootopping white. The finishes I’ve used vary slightly, but the appearance is exactly the same. Blue Peter Varnish is now known as Original Varnish, but I chose to use International Schooner as it has a better UV resistance, I’ve used this for the hull and all the bright work. On the masts and spars I‘ve used International Goldspar, instead of Moisture Cured Varnish or UCP, this is because they have had other varnish applied over the years and I didn‘t see the need to strip to bare wood. Goldspar is quite a tough varnish and wouldn‘t react with the existing finish as would the UCP. The inside of the hull I‘ve painted with International Undercoat for cream (which is now white undercoat), possibly this makes it easier to see if the gloss has covered, but I did tone it slightly to make it off white. The gloss on top of this is International Toplac in Cream 027. The inside of the for’d locker is exactly the same, International Red Danboline. The bootop line is also the same, International Bootopping White. The antifouling Hard Racing Copper is no longer produced, so I‘ve used International Trilux Red. The floorboards I‘ve coated with Goldspar and added a little fine sand to the final coat to give a non slip finish. In terms of repair, very little was needed, a few bits of localised damage that needed a tidy up, the end of the Bumkin had been in disagreement with a harbour wall at some time, and a rather untidy repair had to be corrected to look good again. A bigger consideration was the outboard motor, the motor supplied in 1978 was a 2hpYamaha 2 stroke, an excellent little motor but no longer in production and the original had long since become scrap metal. This was a problem, because the outboard well and slot in the hull had been very closely customised to take that specific motor. I did search for some time for an identical replacement, but to no avail, so I had to compromise on a Mariner 2hp. The Mariner is a similar outboard motor in most respects, it’s actually the same engine but built under licence, the only problem with that is the styling of the cowling which is a bit squarer and a bit bigger. To accommodate this, I’ve been forced to slightly enlarge the slot in the stern and also lower the mounting pad by 15mm. the Mariner now sits OK in the well and the tiller just about clears the motor. I will make a new laminated tiller with a double swan neck later, that will give better clearance over the motor when sailing and the motor tilted up. However that‘s not an urgent task and I’ll have the chance to try the original and a few temporary tillers to ascertain the best shape. As a strange quirk of fate, I went to a boat jumble (a sort of market for new and old boats related bits and pieces) a few weeks ago and what should I see, not one, but two of the 2hp Yamaha outboard motors for sale, but too late for me, I’ve already spent my money on the Mariner. There were a few extra fittings added by the original owner of ootloose but I’ve decided not to replace them, such as the toe straps, I really don’t think a Drascombe needs them. The only thing added that I will be keeping is a nice little heading compass mounted aft of the centrecase, this compass has a damaged base, so I’ve made a neat plywood collar to cover the damage and secure it in place, apart from that all is now as she left the boatyard in 1978. Complete with new name boards. Something that surprised me was how well the little maker‘s nameplate has survived. We traded under the name of John Elliott Boatbuilder and had a few different makers plates, we had a customer who said “We ought to make them from wood as well” so almost as a joke, we made one for his boat from a small piece of thin marine ply, used the office rubber stamp to impress the name, then gave it a few coats of varnish. It was so well received by him that we continued to make them afterwards. 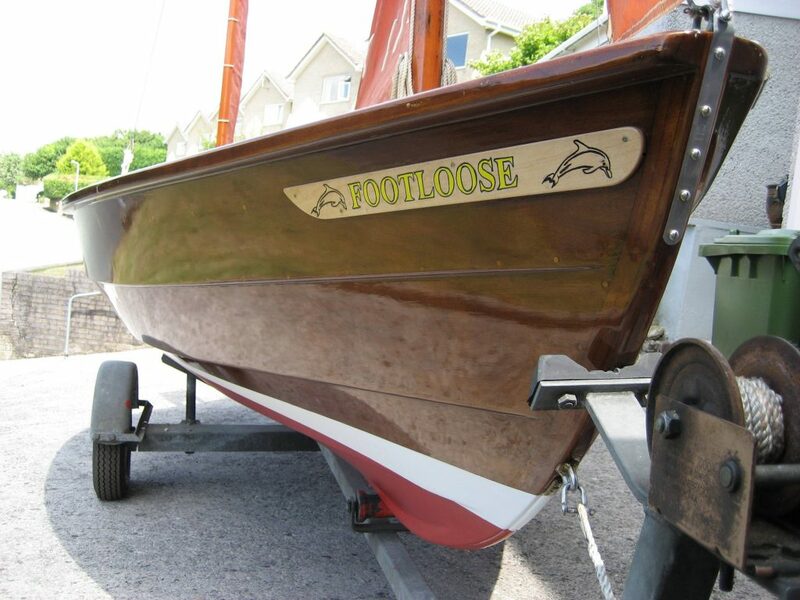 The maker’s nameplate on Footloose has been carefully re-varnished and is still clearly legible. In terms of painting and varnishing, I used 150grit Silicon carbide paper (which is very pale grey in colour) to sand down the entire hull inside and out, the undercoat applied then another sand with 240grit and the final coats from there on. The varnish to the hull and bright work was sanded in a similar manner, but more care taken to ensure no marks appear in the surface to be varnished; a lot of the sanding is carried out by an orbital sander, then the finishing work by hand, always following the direction of the grain of the wood. I would not recommend using any finer grade of sandpaper because the advantage of the mechanical key to the wood or previous coats will be lost. If the finish is required to be exceptional, then of course a finer grade must be used, but it should be a progressive process to maintain the mechanical key as much as possible. One significant factor I did find was the difference between working in a boatyard where everything is left as it is when the days work is done, the next day you just pick up where you left off the day before, all the tools etc. to hand. This compared to dragging the boat in and out of a garage and putting all of the tools away each time as well as keeping an eye on the weather does add considerably to the timescales. However, I suppose the total time spent is around about the 50 hour mark, 50 hours that ‘ve thoroughly enjoyed working on Footloose. It has brought back some very happy memories.